A tee shirt. A hard wearing one that will last. Wear with or without jeans. Unsuitable for some weddings, most funerals and bottom bracket removal . If you think you are a small, this is your size. Great casual wear with unique logo, soft feel and nice fit. Ideal for pre race sign on or post race analysis. 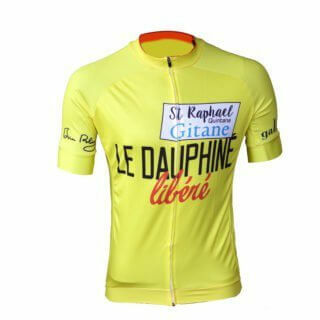 Brian Robinson’s Dauphiné Libéré jersey.